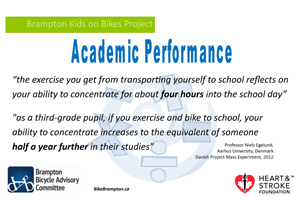 Brampton Kids on Bikes Project research has led to the conclusion that Peel needs to move from TRANSACTIONAL CHANGE to TRANSFORMATIONAL CHANGE. Success requires the ‘big picture’ transformational change can be only be achieved by a combination of both top-down and bottom up strategies. The primary top-down strategy that this report recommends is to call on the Region of Peel to establish a senior leadership taskforce with representation from both of the School Boards, the Region, Mississauga, Brampton and Caledon. This can be done in the context of the existing Peel Safe and Active Routes to School Committee but with a revised mandate. The mandate should define the vision for change along with bold yet achievable targets and timelines that will drive the change for school active transportation aggressively yet sustainably throughout the Region across both School Boards. The benefit of this strategy is that it would engage and unify all stakeholders, ensuring appropriate resources are available for project implementation and minimizing program overlap. This strategy can also be enhanced by an Ontario provincial mandate requiring school travel planning and / or by municipal by-laws focused on providing safe travel access for school-aged children. Expanding school travel planning through a Peel Safe and Active Routes to School (PSARTS) Subcommittee which would scale up the work currently being done at individual schools to incrementally increase the number of schools covered. The newly created Youth Engagement Workshop focusing in high-school implementations is an example of this strategy. Additional presentations to parent groups (go to where the parents are) to create parent support for STP and discover additional parent champions at individual schools. Designing and implementing a multi-media marketing message to the parents and children that has been agreed upon by Region of Peel, the Municipalities, both School Boards and Peel Police. The messaging should endorse school active transportation and overcome the barriers of perceived lack of safety and convenience. 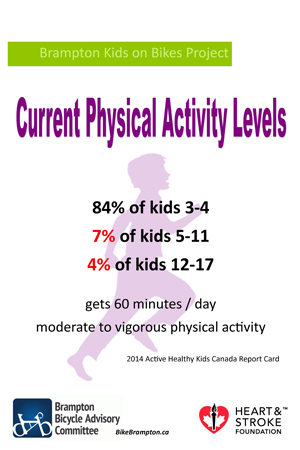 Messages should include safety statistics and support for a “good parents allow active transportation” cultural shift, “improved academic performance” to appeal to both parents and School Boards, and “cycling and walking are cool” to appeal to students. It is recommended that provisions need to be made for safer active transportation infrastructure (safe routes) in each community. Working with Ontario EcoSchools, make modifications to the EcoSchools scoring system that would create a greater incentive for EcoSchools applicants to include active transportation initiatives. The Brampton Kids on Bikes Project team — David, Polly and Dayle thank the Heart & Stroke Foundation for their Spark Advocacy grant that indeed ‘sparked’ this research, and all the stakeholders and parents who have inspired this project to continue after the terms of reference have been completed. The project will continue until the ‘transformative’ change is well underway!